Okay, so this might not be the first thing you would expect to be reading on the blog of a creative agency, but please bear with me! For anyone who knows me, you know how incredibly passionate about all things creative. No day is the same and more often than not, I will have some interesting project I would be running along side the work I do for Ibbleobble. Working for a varied client base from New York to Sydney. I am in equal measures very grateful and very blessed to work in this industry. You have probably heard the saying “If this kind of work was easy, everyone would be doing it” – I cannot think of a statement any more true, which is probably one of the real reasons I am in this game. I like to challenge myself and my ability to see what I can do. Believe me running your own business isn’t easy and I now understand to a certain degree why some of the stress at the top would filter down in to the workplace of some of the agencies I have worked for in the past. If I had a penny for all the people who say to me: “I could never run my own business, how do you manage?” – I would be rich enough to retire! I remember standing on the scales in the new year of 2014 and thinking, I can’t possibly be this weight for someone as tiny as me! So I took it upon myself to do some crazy lifestyle changes, and if I am honest some of it has been REALLY easy. I knocked McDonalds, fizzy drinks (apart from Sparkling water), regular tea and lager on the head and now only drink white spirits occasionally. While this went some way to ‘sorting me out’ – I began a daily routine of walking every morning for an hour. You have to trust me on this, It pretty much changed and improved my working life. I am fortunate enough to live less than a mile from the Cleethorpes sea front so making this kind of lifestyle change that little bit easier. In particular in the summer when the sun’s out, some days genuinely feel like you’re on holiday! Weirdly you get used to the same people you see on the daily basis in particular the ever enthusiastic Paul Walker at WTF or some of the local shop owners throwing a wave of acknowledgement. I probably look like the walking equivalent of Forrest Gump getting my steps in but in truth, I know it’s doing me a world of good. The route I generally take is 4.5 miles and that usually takes about an hour. I can be out by 8.00am and back by 9.00am ready for the day ahead. In that time it gives me a chance to focus on all the work I need to get done in the day. I can prioritize, make calls to clients if need-be and generally get organised. A creative mind generally never stops thinking of ideas and more often than not needs times to plan ahead and I use this time to my advantage. I would even go as far as saying my production levels are higher and more consistent when I have gone for a walk. I am eager to get back and get working. How about that for motivation? 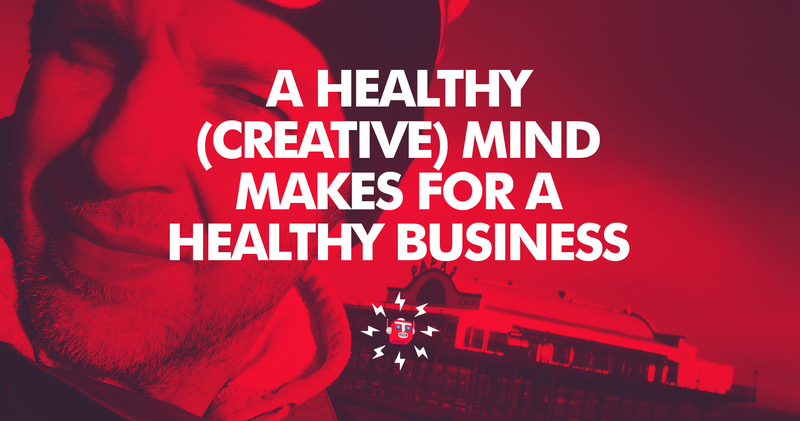 I recently read an Instagram post by Calum Best which read: “Health isn’t just about what you’re eating, it’s also about what you’re thinking and saying” which prompted me to get my bum in to gear and get this blog post together, because a healthy mind cannot be underestimated in the creative industry. I have many friends who like going to the gym or an evening run as their way to focus and a healthy mind, it’s whatever works best for that person. For me I have found an early morning walk really helps and is incredibly instrumental in how KidDotCo – as a company – operates. While some people may think they don’t have enough time to go for a walk, I urge you to give it a go, it has really helped me, not only get rid of the Christmas ‘chunk’ but maintain a healthy mind in the process.